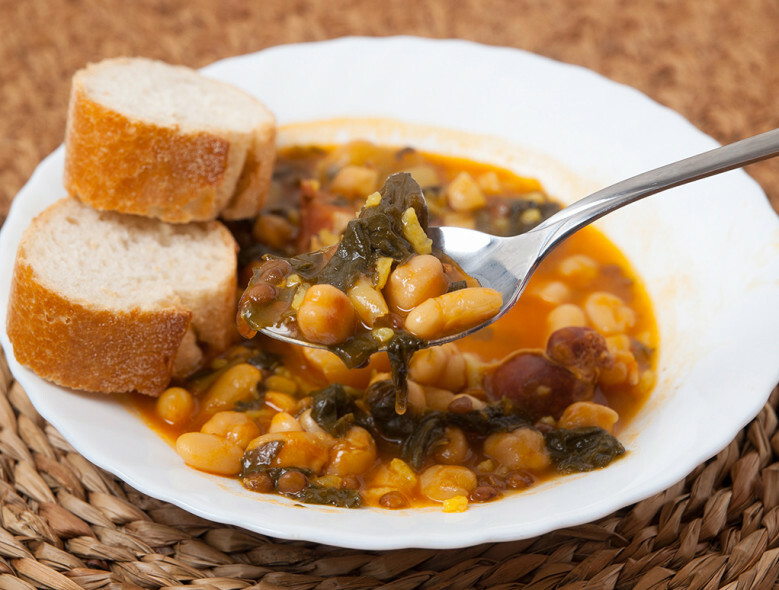 Known in Greece as Fassoulada, this hearty, thick soup is a popular dish in that country. Navy beans, onion, tomatoes, and garlic are the essential basics of this soup. Heat oil in a large saucepan over medium-high heat. Add the onion, zucchini, celery, and garlic. Cook 2 to 3 minutes, until vegetables soften. Add vegetable broth, water, beans, and tomatoes. Break up the tomatoes with the edge of a cooking spoon. Bring soup to a simmer and cook 5 minutes. Add the spinach and thyme. Cook about 1 minute, until the spinach wilts. Add the black pepper. Ladle the soup into 2 bowls and sprinkle with the feta cheese and pistachio nuts. Serve bread on the side.